A fleet of six patrol craft are being built at Destini shipyard for the Malaysian Maritime Enforcement Agency. Image courtesy of Destini Berhad. Construction on the first coastal patrol craft was commenced in November 2015. Image courtesy of Destini Berhad. Radio Holland was contracted to supply navigation and communications for Malaysia’s future patrol craft. Image courtesy of Radio Holland. Malaysia’s future patrol craft incorporate Kelvin Hughes wide-screen navigation radar displays. Image courtesy of Kelvin Hughes Limited. 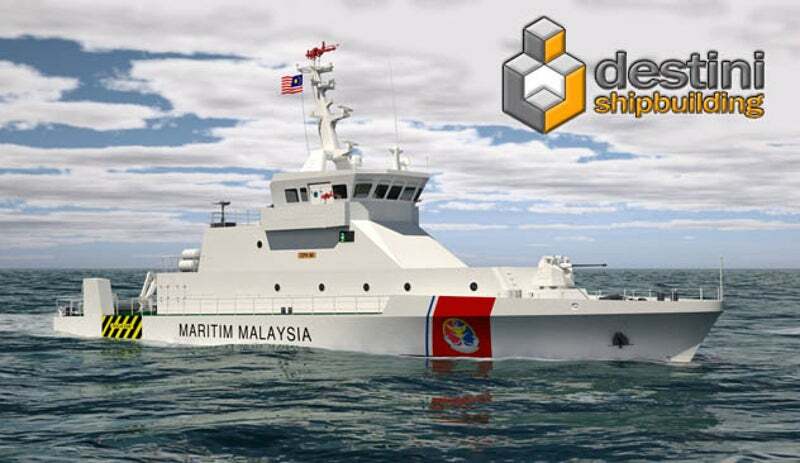 The TKM Bagan Datuk-class is a fleet of new generation patrol craft that Destini Shipbuilding & Engineering, a subsidiary of Destini Berhad, is building for the Malaysian Maritime Enforcement Agency (MMEA). The new coastal patrol craft are intended to meet the MMEA’s operational requirements in the Malaysian exclusive economic zone (EEZ) off the eastern maritime region in Peninsular Malaysia, Sabah and Sarawak. The vessels are ideal for missions such as border patrol, maritime surveillance, search-and-rescue (SAR), law enforcement, counter-piracy, anti-smuggling, firefighting, pollution control, fishery protection, training, and disaster relief. Destini Shipbuilding & Engineering won a $90.43m contract from the MMEA in November 2015 to construct a fleet of six new-generation patrol craft. The MMEA placed an order with Thales in April 2016 for the supply of six maritime Fulmar unmanned air systems (UAS) for integration onto the KM Bagan Datuk-class. Destini Shipbuilding & Engineering awarded a contract to Radio Holland Malaysia in December 2016 to design, supply, install, test and commission navigation and communication equipment for six Malaysian future patrol craft. Keel for the first patrol craft in the class, named KM Bagan Datuk, was laid in December 2015 and its launching ceremony took place at Destini’s shipyard in Port Klang, Malaysia, in March 2017. All six vessels are expected to be commissioned by the MMEA by June 2018. The KM Bagan Datuk-class coastal patrol vessels are based on a 40m coastal patrol vessel designed by German shipyard Fassmer Group. The vessel’s hull is made of steel, while the superstructure is built using marine aluminium. The overall and waterline lengths of the vessel are 44.25m and 42.7m respectively, while the beam is 7.7m and the draught is 1.95m. With a displacement of 297t, the patrol craft can carry up to 41 crew members. Each vessel in the class will be fitted with a Fulmar unmanned aerial vehicle system, which is ideal to conduct surveillance and SAR missions in Malaysian waters. The UAS is launched using a catapult launcher located behind the vessel’s main armament. It is recovered by a net-based impact absorbing system at the aft. "All six vessels are expected to be commissioned by the MMEA by June 2018." The ship’s bridge and navigational systems are located amidships behind the Fulmar UAV launcher. A rigid-hull inflatable boat (RHIB) is carried at the stern of the vessel for patrol and transportation duties. It is deployed and retrieved at the stern using a crane. The patrol craft is also equipped with a pair of nozzles on the bridge wings for firefighting operations at sea. The main armament of the MEMA’s new-generation patrol vessels is a SMASH remote-controlled stabilised weapon station developed by Turkish firm, Aselsan. Fitted behind the bow, the naval gun system can engage static and moving targets using its dual-feed 30mm automatic cannon. The SMASH weapon system also incorporates an electro-optical sensor unit to detect and track targets while on the move. The vessels can be optionally armed with 12.7mm machine guns on the port and starboard sides at the rear to defend light armoured targets. The KM Bagan Datuk-class coastal patrol vessels are installed with a wide range of navigation and communication systems developed by companies such as Simrad, Motorola, Jotron, SAAB, Sailor, and Skipper. The equipment includes radars, echo sounder, VHF, autopilot, chartplotter, GPS antenna, automatic identification system (AIS), steering system, thermal cameras, and forward-looking infrared (FLIR) systems. The ships also incorporate Kelvin Hughes S-Band SharpEye radar, 12kW X-Band radar, and a wide-screen navigation radar display. Each vessel in the KM Bagan Datuk-class is powered by two MTU diesel engines, which each produce an output power of 1,920kW. The new-generation patrol craft offers a top speed of 24k and can sail up to a distance of 2,000nm at 12k. Ships Electronic Services (SES) supplies, installs, and maintains maritime communication and navigation electronics. The firm has more than 35 years of experience in the commercial shipping, leisure, fishing, and offshore oil industries.